There may not be the normal slew of local shows to write home about this week, but there is a BK set by a new band that should be cause for alarm. The good kind of alarm, that is. 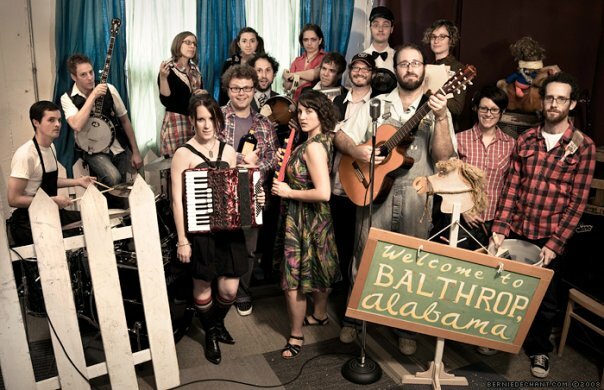 Balthrop, Alabama is a town that is a band … or maybe, it’s a band that is a town. Whatever it is, there are about a dozen Balthropers in whole, founded by a brother-sister duo who moved to Brooklyn in 2006 and started making pretty tunes like the one below. Their sound conjures up a tonal image of Of Monsters and Men, but is sated with softer ramblings reminiscent of First Aid Kit. You can check them out in person at Littlefield this fine weekend. Also, the Downtown Festival visits Rockwood Music Hall on Friday, bringing with it the lovely Anais Mitchell and another group I’m finding it quite worthwhile to familiarize myself with – Port St. Willow.